Calcutta High Court Judge, Justice Karnan against whom the Supreme Court has initiated contempt proceedings finally appeared before the Chief Justice-led seven judge bench today. After an hour-long gripping exchange between Karnan and the bench Chief Justice J S Khehar gave the HC judge four weeks time to file a written reply. "We now wish to proceed only after receiving a written response from Justice Karnan within four weeks..the response shall be by way of affidavit"the CJI said. At this Karnan requested that his work may be restored. "If my work is not restored give any punishment. First impose punishment. I will go to jail. If work is not restored i will not be in a position to file a reply"
CJI then said : If you feel that you are not in a mental position to reply give a medical certificate. Then we will consider". As the bench rose after the proceedings Karnan was heard saying "I Want punishment..please record it i will not appear in next hearing if my work is not restored". CJI had in his order refused to restore Karnans work despite his repeated requests. He had put that as a pre-condition for apologising. Adding more drama to the entire episode Karnan, known for his several controversial acts earlier, had called a press conference in Kolkata and termed the warrant “unconstitutional” and alleged he was being targeted for being a Dalit. “Staying” the order, he also issued an 'order' of registration of a case under the SC/ST Act against Chief Justice of India Justice J S Khehar and six other judges- Justices Dipak Misra, J Chelameswar, Ranjan Gogoi, M B Lokur, P C Ghose and Kurian Joseph who had issued the bailable warrant. The SC bench had directed the Director General of West Bengal Police to execute the warrants on Justice Karnan to ensure his presence in the Supreme Court at 10.30 AM today. 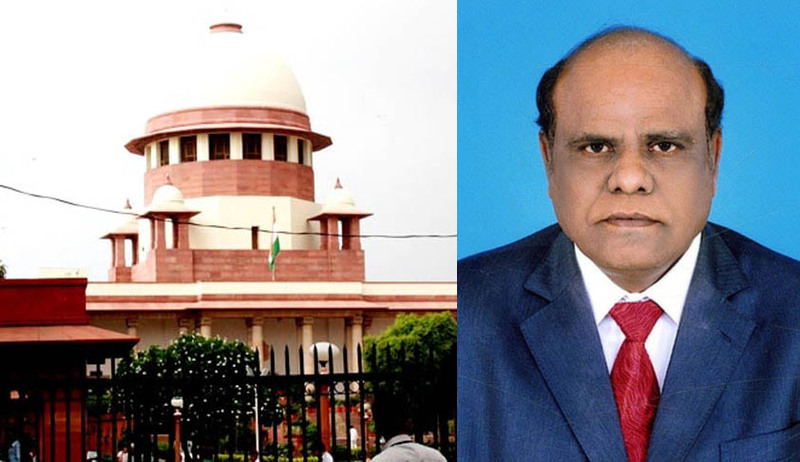 After Justice Karnan had defied the SC order by refusing to appear before it on February 13, he wrote a letter to the SC Secretary General accusing the Chief Justice-led bench of upper caste bias in initiating proceedings as he belonged to the Dalit community.